Sadly, the first item on the Chairman’s report is always to mark the loss of members of the Society during the year, and last Christmas, Beryl Brand, former Chairman and President of the Society passed away in hospital after a short illness. She had been a stalwart member of many organisations in the village and had given her support and encouragement to many. We miss her. 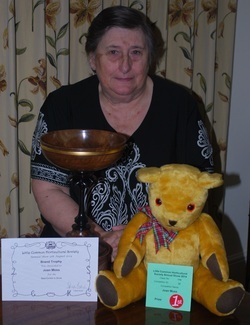 We wanted to commemorate her as appropriately as possible and have done so by nominating a trophy for a bread class in the annual show, and a trophy for annual points awarded for showing orchids in the monthly shows. In addition, thanks to the kindness and generosity of Maurice Ekins, who commissioned, and donated it, we have the Brand Memorial Bowl. This is awarded to the winner of the object voted “Best in Show” by the Judges at the Annual Show. The bowl has been made by Maggie Wright, a prize winning wood turner and carver and is here on display for those who have not seen it. This year it was won by Mrs. Joan Moss. In addition, the members of Beryl’s family wished to participate in providing a memorial to their late mother, so it has been decided that a seat will be placed in Shepherds Close, probably on the green in front of the Methodist Church. We are very grateful to Stuart Earl for his help in dealing with the ESCC, ES Highways and Rother DC in order to deal with the necessary formalities required for placing a seat in a public place. We have had some memorable speakers in the last year, including Geoff Hutchinson, whose talk on the Life of a Benedictine monk at Battle Abbey was given extra realism by the howling sounds which came from the stage area where serious damage had been incurred during the terrible storm of Christmastide. Harry Townsend took us through New Zealand with his wheelbarrow, and he will be returning next year to tell us all about his time at Kew Gardens. Lesley Chamberlain filled the hall to capacity with her talk on Gertrude Jekyll and Edwin Lutyens and Wendy Bates from Rotherview Nursery filled it with wonderful Camellias, many of them in bloom, for her talk. The Annual Lunch was a great success, held for the first time at the Powdermills Hotel, Battle. It was a beautiful Spring day with warm sunshine and the hotel grounds were looking lovely. After lunch we were much entertained by Jonathan Linsley, an actor who gave us an interesting insight into being in Hollywood pictures and how theatrical superstitions arose and how important they are to the profession. Everyone said how much they had enjoyed their day and we will be returning to Powdermills in June to celebrate our 70th Anniversary. Most outings have been very well supported and much enjoyed. After such a wet winter we hardly dared hope that our trip to Great Comp and Hadlow College in March would escape the weather, but it did – most people having completed their tour of the Hadlow Gardens and gone in for tea before the blizzard hit! It was a lovely day and the gardens at Great Comp are certainly worth a visit and the Hellebores and other early flowering plants at Hadlow not to be missed. Sadly the trip to Scotney Castle had to be cancelled, but we had a lovely afternoon at Bates Green, Carolyn McCutcheon’s fabulous garden at Arlington. This is full of wonderful and rare plants and shrubs, it was a gloriously warm and sunny day too, and afternoon tea and a look round Middle Farm at Firle ended a good day. Our final trip, to Wisley, last month was again attended by a dry if cloudy day, but it was neither cold nor windy, and given that their Autumn Food Fair was in full swing when we went, there was almost too much to see and enjoy. Our sincere thanks to Sue Fasey for all her hard work in arranging these trips! The Annual Show was again a great success. Sadly entries are down. Whether this was due to weather or the fact that fewer people are gardening we can’t say. The Mayor and Mayoress, Cllr Brian and Mrs Susan Kentfield much enjoyed their visit and sent a very nice letter of thanks afterwards. More details, including information about the finances will be given in due course. Thanks to Eric Fasey, the excellent publicity for the Society has continued this year, and we again got a wonderful spread, with colour pictures in the Observer. I would like to take this opportunity to thank everyone who helped make the show such a success, whatever you did, we much appreciate it – it could not be so successful without the help we have from our members. As I am sure many of you will have seen, we have a beautiful new Website, thanks entirely to the efforts of Andy Hardy, which has brought the society to the attention of many more people. Thanks to the technology, we know that people are accessing and reading it, and have received enquiries as a result of it. This, together with Eric’s efforts getting our name and events well publicised in many local media has increased our profile. It’s important that we bring in new members, for a society such as ours to survive and thrive we need to have new people coming along each year. The coffee mornings have been mostly very well attended and have brought good income to the Society. Using St Martha’s Hall, and bringing in additional stallholders (thanks to Eric again) did make a great difference to attendance and profit. Martin will be filling you in with his financial report in due course. However, whilst we did make a reasonable profit at the September coffee morning, support from our members was very poor and given that it takes a lot of hard work to make these events happen, we’ve decided not to hold one in September next year. We’re looking forward to our next Coffee Morning, again at St Martha’s next Saturday 22nd Nov. The committee has been delighted to see so many entries, and from new members as well, in the regular monthly shows. There have been some lovely flowers, produce and entries in the domestic classes and we hope that more members will be encouraged to participate in these shows on a regular basis. Finally, I must thank our President, Mr Alan Gilby for his continuing help and support. I have not thanked individually, all of the members of the Committee for all of the hard work they have put into organising the events, outings and Annual Show which we have undertaken this year but none of it would be possible without their efforts, hard work and commitment to the Society. We are sadly losing Lal and Gloria from the Committee this year. They’ve both done so much in connection with the Annual and Monthly Shows and we give them many thanks for all they’ve done. Thanks too, to all those members who help with setting up the hall and tidying away afterwards, both for the monthly meetings and the Annual Show, and helping with the catering and in the kitchen. Lastly, all the members of the Society, for turning out regularly to the monthly meetings, supporting the outings and events, and entering the Shows. We are all looking forward to another successful year in 2015 which, as it will be our 70th Anniversary, is an important milestone for the Society, and we want this 70th year to be marked as the significant event it is and a tribute to all of the members, committees, and Presidents who have all contributed to making the Society what it is today.